Hungarian Prime Minister Viktor Orban addresses the media on the occasion of a meeting with Austrian Chancellor Werner Faymann and Vice Chancellor Reinhold Mitterlehner at the Hungarian Embassy in Vienna, Austria, Sept. 25, 2015. Hungarian Prime Minister Viktor Orban says he will seek support for his country's efforts to block the flood of migrants at its southern border with Croatia, including sealing the border as Hungary did with Serbia. Orban spoke Friday in a news conference in Vienna after meeting with Austrian Chancellor Werner Faymann. The Hungarian prime minister promised that whatever action his country takes will be "transparent." Orban praised Serbia's cooperation with Hungary on dealing with the flood of migrants. But he said he has his doubts about whether Croatia is complying in the same fashion with the European Union rules on dealing with migrants and border controls. On Thursday, the European Union announced its Mediterranean naval operation will enter the second phase of an operation against migrant traffickers, beginning October 7. Speaking at the Rome headquarters of the EU operation, or EUNAVFOR MED, on Thursday, the bloc’s foreign affairs chief Federica Mogherini announced the decision, saying that “the assets are ready." 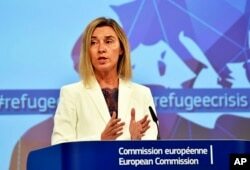 Explaining the new phase, Mogherini said that European warships will operate against traffickers, conducting searches, and, if necessary, diverting suspicious vessels, but only in international waters without entering Libyan territory. EU High Representative For Foreign Affairs and Security Policy Federica Mogherini, talks to the media prior an emergency EU heads of state summit on migration at the EU Commission headquarters in Brussels, Sept. 23, 2015. The three-phase operation, launched at the end of June, includes the use of military force against migrant traffickers, the seizure of vessels used to transport people across the Mediterranean Sea, most of them departing from the coast of Libya, as well as disposal of vessels and related assets, preferably before use, and also the apprehension of traffickers and smugglers. 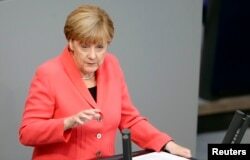 Meanwhile, German Chancellor Angela Merkel said that Europe's agreement on a quota plan to accommodate 120,000 migrants is a sign of unity, but cautioned that it is only a first step. German Chancellor Angela Merkel gestures as she delivers the government's declaration on current refugee crisis at the lower house of parliament Bundestag in Berlin, Sept. 24, 2015. She said in a meeting in Berlin Thursday that Europe is still "very far" from where it needs to be in dealing with the situation. She said the violence in Syria that caused the displacement of so many people can only be resolved with help from the United States, Russia, and the Middle East. On Wednesday, European Union leaders agreed to give $1.1 billion to international aid agencies helping refugees at camps near their home countries. The European Council President Donald Tusk made the announcement after an emergency summit in Brussels ended early Thursday. He said the leaders from the 28 EU countries agreed on increased aid to countries like Lebanon, Jordan and Turkey which are hosting millions of refugees from war-torn Syria. The leaders also agreed to set up "hotspots'' by the end of November where EU experts can quickly register and identify people eligible for refugee protection, Tusk said. The move is also intended to quickly filter out economic migrants who are unlikely to qualify for asylum in Europe. He did not say if the countries had reached an understanding on how to cope with the thousands of asylum-seekers streaming to Europe, even after interior ministers adopted a country-by-country quota plan Tuesday to disperse 120,000 migrants throughout the 28-nation bloc. Slovakia, one of four countries that voted against the quota proposal, said it would not accept any refugees and would sue to challenge the plan. Hungarian Prime Minister Viktor Orbán attacked German Chancellor Angela Merkel for her support of the quotas, calling it "moral imperialism." 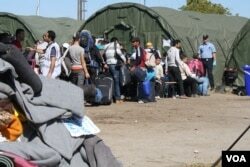 But Romania, another quota opponent, said it would accept the additional 2,400 migrants called for in the quota system. Poland, which initially objected to the quotas, said it would take in about 5,000 in addition to another 2,000 it earlier agreed to accept. Former Polish President Bronislaw Komorowski said, "The problem is not 'how many,' but 'how.' It doesn't make sense to say: let's host everyone. But it doesn't make sense to threaten either and to build a xenophobic atmosphere." Ahead of the summit, EU President Tusk told the heads of state in a letter, "There is a long list of issues where we could blame one another, but it will not help us in finding a common solution." He said the EU leaders "must absolutely work out policies that we can implement in order to help each other." Germany has by far accepted the biggest number of migrants. But Berlin's intelligence chief, Hans-Georg Maassen, warned Tuesday that radical Islamists already in Germany could try to recruit refugees for terrorist attacks on the pretext of offering them humanitarian assistance.